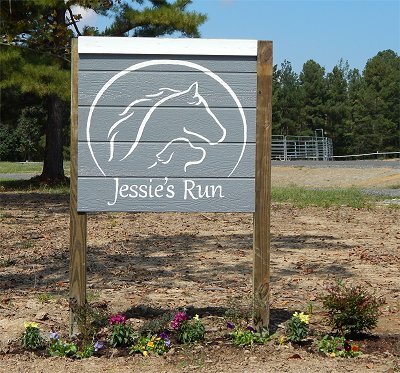 Jessie's Run is your place for horse clinics, training, and special events. We have a 72' x 154' covered arena, a hospitality building (kitchen, bath, and meeting space), LQ hook-ups, stalls, and plenty of parking. We also have outdoor obstacles, a round pen, and a pond for fishing. Oh, and Wifi! For the last ~15 years, we've travelled to many clinics and horse properties, getting to see what we think works...and what doesn't quite work. We've been to some fancy places that had so many rules that it was difficult to "kick back and relax". We've been to some "not so fancy" places where horses were getting injured in old stalls and fences were falling down. We've been to farms with almost no parking and farms that are so far off the beaten path that getting there was a challenge. Once our children "left the nest," we decided it was time to stop travelling and invite people to come here. We purchased this property, began planning what we wanted to build and where (the 850 sq ft house was here, but that's it!) and "Jessie's Run" was in the works. Hopefully, we've managed to keep many of the good things we've seen while avoiding the negatives. We're not a big facility, but we hope you'll feel comfortable here. As you can tell from our website, we like things clean, simple, and functional. We want Jessie's Run to be a relaxing and peaceful setting for you to enjoy while attending a clinic, seminar, or other training event. We have a 72' x 154' covered arena, a hospitality building (kitchen, bath, and meeting space), LQ hook-ups, stalls, and plenty of parking. We also have outdoor obstacles, a round pen, and a pond for fishing. Oh, and Wifi! Our rules are simple; be respectful, be safe and responsible...that should just about cover it. If you need anything to make your time here more comfortable and productive, let us know and we'll see what we can do. Hope to see you soon!